If you are a military veteran that needs legal assistance in the area of criminal law, you may contact one of the listed legal resources. The Orange County Bar Association assumes no responsibility for the legal service providers which appear on this list. The Public Defender staffs the Orange County Superior Court's Veterans Court. Veterans Court offers a therapeutic alternative and support services to US military service personnel who become involved with the criminal justice system, and who are in need of effective mental health treatment to address issues such as Post Traumatic Stress Disorder (PTSD), Traumatic Brain Injury (TBI) and other serious mental health problems. The court may assess Public Defender fees at the conclusion of the proceedings. OC Veteran Service Center is located in Santa Ana and assists veterans with claims, homelessness, and access to state and federal healthcare and compensation and pension benefits. The OC Veteran Service Center also assist veterans with criminal and benefit matters and can help veterans get in touch with the key players at the VA Long Beach and the Orange County Veteran Court. Under penal code 1170.9 veteran court and alternative sentencing there is no longer a combat requirement as of 2013. Contact: 1-855-886-5400 then ask for Veteran Service Department of Orange County. They take appointments and walk in's M-F 9-4:30. To meet the legal needs of the growing veteran population, PLC created an outreach effort to military veterans called Operation Veterans Re-Entry. This program is dedicated to providing Orange County veterans and their families with free legal assistance to facilitate their re-entry into civilian life, including those who are homeless. California?s military diversion program, establishes a pretrial diversion program for current and former members of the U.S. military who are charged with a misdemeanor offense. Under Penal Code, section 1001.80, subdivision (a), the military diversion program applies to a defendant accused of a misdemeanor offense, who was or currently is a member of the United States military, and who may be suffering from sexual trauma, traumatic brain injury[TBI], post-traumatic stress disorder [PTSD], substance abuse, or mental health problems as a result of his or her military service." If a defendant meets this criteria, the Court may place him or her into a pretrial diversion program. The mission of Legal Aid Society of Orange County and Community Legal Services in southeast Los Angeles County is to provide civil legal services to low-income individuals and to promote equal access to the justice system through advocacy, legal counseling, innovative self-help services, in-depth legal representation, economic development and community education. The UCI Veterans Clinic connects members of the armed services in Southern California with meaningful legal services and educates the local community on veterans? issues. The clinic?s goal is to create a cohesive network of experienced providers of veterans services, making UCI Law one of the premiere institutions for veterans? benefits claims and discharge upgrades. Veterans? 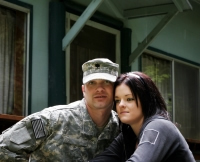 courts are hybrid drug and mental health courts that use the drug court model to serve veterans struggling with addiction, serious mental illness and/or co-occurring disorders. They promote sobriety, recovery and stability through a coordinated response that involves cooperation and collaboration with the traditional partners found in drug and mental health courts in addition of the U.S. Department of Veterans Affairs health care networks, the Veterans' Benefits Administration, and, in some programs, volunteer veteran mentors and veterans' family support organizations. Veterans Court opened its doors on September 13, 2010. It is a pilot program designed to address those charged with felony court cases who have served honorably in the United States military. Veterans Court is an alternative to state prison and joins other alternative sentencing programs currently under the administration of Judge Michael Tynan in Department 642 at the Clara Shortridge Foltz Criminal Justice Center. Veterans Court is a collaborative effort between the Superior Court, District Attorney, Public Defender, Alternate Public Defender and the Department of Veterans Affairs (hereinafter the VA). The court may accept cases from any court in the County following an eligiblity and suitability screening process. LACBA's Veterans Project works to identify and address opportunities to assist veterans, active military personnel and reservists with their legal needs. Since it was founded three years ago, the Veterans Project has already helped resolve and refer hundreds of matters on behalf of service men and women. The Veterans Project's next initiative is a new partnership between U.S. VETS and Los Angeles County to add pro bono legal services at Patriotic Hall in downtown Los Angeles. The program will initially target veterans who are unemployed and at risk of homelessness by offering legal services, clinics, and self-help workshops in the areas of: Clearing Outstanding Tickets and Warrants, Reinstating California Driver Licenses and Expungements: Clearing Criminal Record for Employment. Public Counsel's Center for Veterans' Advancement (CVA), a national leader in veteran's advocacy, provides direct representation, or representation through pro bono partners, to veterans and their families. CVA provides legal representation at both the local and national levels, and coordinates its work with efforts underway to establish special "Veterans' Courts" in Northern and Southern California designed to meet the unique needs of returning veterans. CVA also manages legal clinics, including one of the largest pro bono advocacy programs in the United States.